Chief Minister Pema Khandu today had a meeting with CMD of Indeco Hotels Steve Borgia to explore on the possibility of promoting Arunachal as the next spiritual destination. Arunachal being a Himalayan state offers perfect place for tourists to relax in a peaceful and tranquil environment, said the Chief Minister. The CMD proposed the idea of establishing hotels and home stay with spiritual retreat centres. The idea is to exploit the talent and skills of the Northeast people in hospitality sector. It was informed that across the country it’s the Northeast people who are leading the hospitality industry. 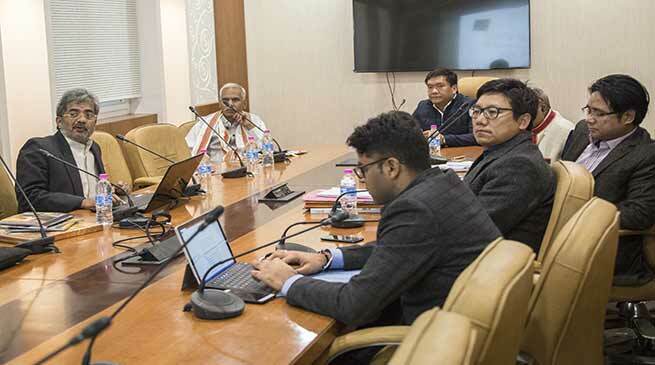 The meeting also explored on possibility of exploiting the potentials of rural tourism as Arunachal being blessed with colourful tribal cultures and serene natural landscapes could offer best place for spiritual retreat. DONER Secretary Naveen Varma, Chief Secretary Satya Gopal and Tourism Secretary Dr Joram Beda also attended the meeting.